The updated iMac is up to 70% faster, using Intel quad-core processors and high-speed Thunderbolt technology, Apple claims. Using Intel's latest Core i5 and i7 processors and AMD's Radeon HD graphics processors, Apple says its updated Macintosh desktop PCs are three times more powerful and responsive. The machines are the first to use high-speed PC connection technology called Thunderbolt. Philip Schiller, Apple's senior vice-president of worldwide product marketing, said: "With next-generation quad-core processors, powerful new graphics, Thunderbolt technology and a FaceTime HD camera, we have made the world's best desktop even better. Thunderbolt technology is expected to be widely adopted as a new standard for high-performance I/O." 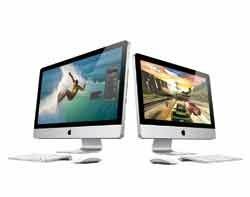 The latest iMac also includes Mac OS X Snow Leopard, iLife, iMovie, GarageBand and iPhoto. Apple's grip on the PC market is expected to increase as the consumerisation of IT fuels the use of its devices in corporate environments. A recent report by research firm Canalys shows the PC market grew 7% in the first three months of 2011 at the expense of notebook and netbook shipments after the popularity of Apple's iPad surged. Latest figures from Strategy Analytics also show Apple shipped a record 18.6 million iPhone handsets worldwide in the first quarter of 2011, up from 8.8 million units in the same period in 2010. The company's increased mobile handset market share to 5.3% is likely to fuel the platform's popularity among businesses for business-to-consumer applications and mobile marketing.